This is the last week before school starts! Yippee! My daughter has been going to camps all summer long and she is exhausted and ready to be back in the classroom. We're coming up on week 10 of what I've been calling "The Summer of Camp." This week it's just a four-day, half day clay camp at the local arts center. She's excited for the break! Have a great week everyone! 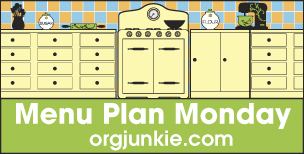 This post is linked to Menu Plan Monday on orgjunkie.com.